Aniracetam is a substance that belongs to the racetam class and is an ampkamine nootropic. Ampkamines are substances known to improve concentration and levels of alertness . Similarly, nootropics are substances that are known to improve cognitive function and mental prowess, boosting things such as memory recollection and the uptake of new information. Aniracetam is the commercial name for a substance that is systemically known as 1-[(4-methoxybenzoyl)]- 2-pyrrolidinone. It is also sold under many other names around the world, such as Memodrin, Referan, Ampamet, Draganon and Sarpul. The substance was first synthesized by Swiss pharmaceutical company Hoffman-La Roche over thirty years ago. 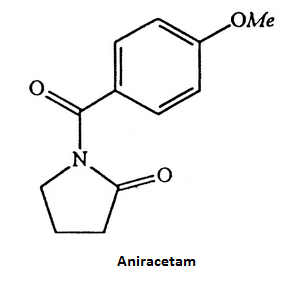 Today, Aniracetam is sold throughout Europe as a prescription drug and purchased commercially around the globe . What are the benefits associated with taking aniracetam? Aniracetam has a similar mechanism to piracetam, although it differs in that it stimulates the AMPA receptors in the brain. AMPA ( α-amino-3-hydroxy-5-methyl-4-isoxazolepropionic acid) receptors are ionotropic transmembrane receptors in the brain that respond to glutamate [1, 2, 4]. They are found throughout the brain and are the most common type of neurological receptor found in the CNS (Central Nervous System). For this reason, aniracetam is considered to be more potent and more effective than its counterpart piracetam [1, 2]. See the study on pubmed regarding the potential treatment for CNS disorders. Aniracetam’s mood altering benefits are likely a result of its interactions with serotonin and dopamine receptors, which are responsible for managing these neurotransmitters . Neurotransmitters are key in regulating mood, happiness, and pleasure. In addition to these, aniracetam is also being looked at as a potential treatment for Alzheimer’s disease, as well as other degenerative brain diseases and diseases that affect memory [1, 12]. Aniracetam is generally considered more potent than its closely related substance piracetam [1, 2]. Many people prefer Aniracetam because it is more potent, requiring a much smaller dosage. As is the case with any nootropic or brain altering substance, anyone who is thinking about whether or not to buy aniracetam should consult a medical professional first. This is to ensure that they are suitable in terms of health and fitness to use the substance, to be appropriately informed of the required dosage of aniracetam and to be fully aware of any potentially negative side effects that they may experience when using the substance. What are the negative side effects associated with taking aniracetam? Supplement with Choline to avoid common aniracetam side effects. Aniracetam is available both in capsules and as a bulk powder. Dosage varies from person to person and by the method it is being taken. A typical starting point is taking 750mg of the substance two or three times a day. This is to keep the effects as long lasting as possible while keeping the dosage down. From here, it is possible to judge whether upping or lowering the dose is appropriate for the individual taking the substance. Aniracetam can also be “stacked” with other supplements. A common stack includes aniracetam and piracetam, to boost the nootropic effects of both. Similarly, many people recommend taking aniracetam with a substance that contains choline, such as CDP or Alpha GPC (L-Alpha glycerylphosphorylcholine). This is because choline deficiency is liable to cause symptoms of anxiety and depression, and as such would work against the positive effects of aniracetam, thereby lowering its potency. As with any combination of substances, it is extremely important to seek medical counsel before combining aniracetam with any other drug, be it piracetam, Alpha GPC or anything else. Having looked at the information available about aniracetam, it is plain to see that the substance is very popular among people who buy nootropics and use them to boost their mental drive and well-being. There are little known side effects associated with the substance, and many glowing reviews of its benefits can be found online – ranging from praising its anxiolytic effects, to sending users into a “multi-tasking frenzy,” aniracetam has a wide variety of benefits [6, 8]. If you’re interested in experiences from others on aniracetam, we’ve compiled some aniracetam reviews. There’s also a podcast which covers the host’s experience with this nootropic. Finally, be sure to track your performance if you decide to take aniracetam or any other racetam. This net gets even wider when the substance is stacked with piracetam to boost its potential, and it’s easy to see why the substance is sold around Europe as a prescription medication . It is important and interesting to note, however, that aniracetam has not been approved by the FDA for prescription use in the United States. It is available over the counter at many online stores though. In terms of whether to buy aniracetam capsules or to buy aniracetam bulk powder, the debate largely comes down to a matter of personal preference. As is the case when considering any new nootropic to add to your supplements, it is important to research yourself and ideally consult a medical professional beforehand to reduce the likelihood of a negative experience, incorrect dosage or any adverse side effects that may occur.